Sana'a, Yemen is currently estimated to become the first waterless capital in the world within the decade. Photo by Alexbip. The Phillips Livable Cities Award is a global initiative that celebrates simple solutions to improve health and well-being in cities. The award competition was designed to generate practical and achievable ideas to improve the quality of life for city-dwellers across the world. The winners of the competition were announced yesterday in Amsterdam. The competition drew entries from individuals, communities, non-governmental organizations and businesses. Upon receiving 450 different ideas from 29 countries, the Phillips Livable Cities Award selected eight finalists, out of which “Rainwater Aggregation for Yemen” was selected as the overall winner by an expert judge panel and public vote. Sabrina Faber, the creator of the project, received a grant of €75,000 (about US $125,000) to make her idea a reality. 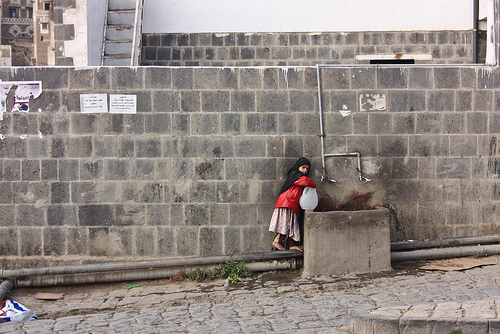 Faber, a long time resident of Yemen, arrived at her creation after having experienced water shortages herself. To resolve issues of water access, Faber wanted to implement a method she had learned while trekking the countryside. According to the project’s website, collecting rainwater on mountaintop cisterns was a practice of local Yemeni people to conserve water. Faber’s project proposal incorporates this very traditional Yemeni technique to solve the current problems of water access. By modifying existing structures in the capital city, Sana’a, the project would be able to capture, filter and store 10,000 liters to 50,000 liters of rainwater per structure, providing a clean and dependable water source to residents. The two second prize winners were Manuel Rapoport, for his project on creating portable recreational areas in Buenos Aires, Argentina, and James Kityo, for creating shelters in Kampala to offer protection and provide health education. Both winners were awarded €25,000 each (about US $42,000). For more information on the winners and all of the finalists, please click here.